sebutir MUTIARA putih yang terus bersinar. : I Just Love SPS! Today, some of my course mates and I took the SPS bus from KP to our faculty. Oh my. I just love SPS! I love the chairs. They're not that really soft but they are comfortable enough for me. I think that SPS chairs could give me the right body posture. 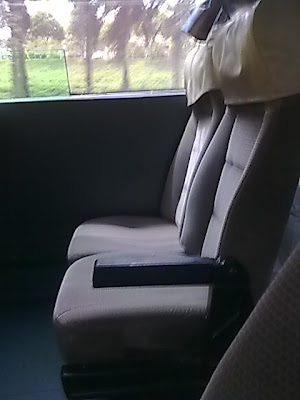 It could avoid me from getting a hard nap in the bus, especially from KP to the faculty. Haha. 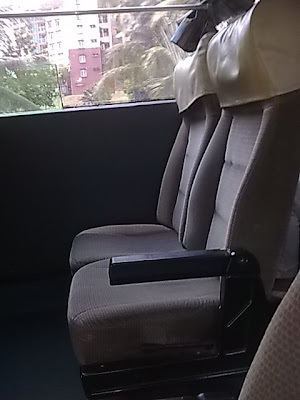 Here I took the pictures of the bus chairs. Okay. 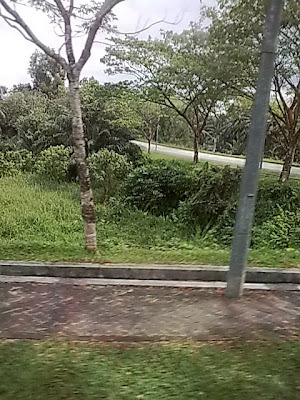 And I took a picture of a view from inside the bus. It looks nice. It was a view placed somewhere around KTC. Here it goes. Ah. I just hope that the SPS bus could shorten it's way from college to the faculty. Since I always took the bus late, therefore I really need to arrive at the class in a very short time. And SPS is just not perfect enough for me to get to the class on time. So, I need to think twice or tripe or more before took SPS to class. Or else, I'll be punished for coming late. Hoho.